Re-posted from TFF’s earlier website on November 1, 2016 with links to later materials being added at the bottom. The Right Livelihood Award Foundation’s Award Ceremony to take place on November 25. The group is – as will be seen below – treated as uncontroversial in virtually all Western mainstream media. However, there is enough material with documentation to merit caution. 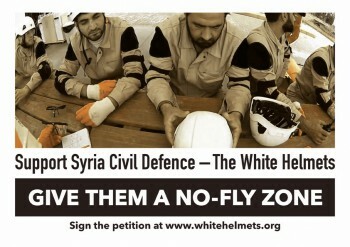 If you read media reports about the White Helmets and do not see the author mention that this group’s real identity is disputed and functions controversial you can be sure that you are wasting your time with somebody who is politically incredibly naive, or gullible; someone who has not done his or her research or is knowingly part of a deceptive effort serving a one-sided political agenda. The White Helmets definitely is an controversial NGO – at the same time as it is (made) difficult to understand clearly what it really is. And until the whole picture has been developed, anyone ought to be cautious with taking information about them at face value. So much must be clear given the links below. That said, this author has not been on the ground but has studied both the pro- et contra links provided below. 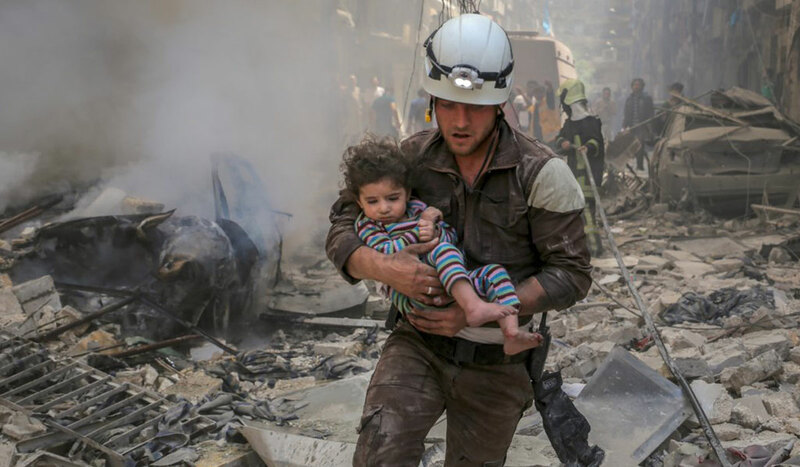 Some observers draw the conclusion that the White Helmets – Syrian Civil Defence – is purely good guys rescuing lots of people, children in particular. The opposite advocacy claims that, all told, they are part of the terrorist groups, serve Western governments with intelligence and that their backers run political propaganda in their name and that they are simply executioners – murderers with a human face. But does it have to be either/or? An alternative hypothesis could be that the White Helmets is a dual-purpose organisation. They claim to be ordinary Syrian volunteers who came together around the idea of saving lives and are truly altruistic “bakers, tailors, engineers, pharmacists, painters, carpenters, students and many more, the White Helmets are volunteers from all walks of life.” It could well be that some of them actually are, even a majority. That doesn’t preclude that other elements – not the least those operating outside Syria such as foundations, PR and marketing firms, change organisations, NATO government and NGOs are in it with less noble, war-promoting purposes. Find below a link collection – long but fascinating in its wealth of information. We bring it as a help to those seriously interested in Syria’s fate and in studying how opinions are being built by means of connected actors in a rather opaque networking structure, in how NGOs have increasingly become Near-governmental organisations and for those who do not want to sound foolish when they discuss these matters. First some links to how the the White Helmets presents themselves. Second, some mainstream media articles in their favour of and praising it – including some that argue that the White Helmets ought to receive the Nobel Peace Prize (which happens to be nonsense, since they don’t even remotely qualify according to the criteria in Alfred Nobel’s very clear will and the prize is not a general do-good-prize. In addition, it must be doubted that the Nobel Committee will get more persuaded by the White Helmets’ – quite immodest – campaign in favour of their own candidacy). 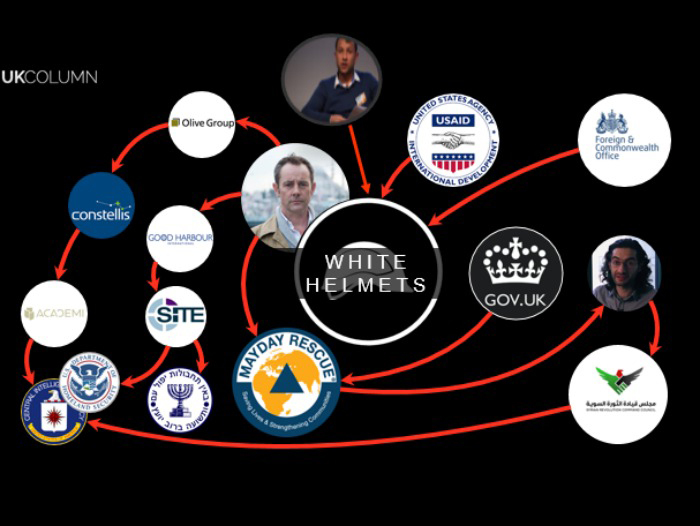 Third some links to the comprehensive network of organisations, including governments, that the White Helmets seem to be part of – and it is quite a confusing lot with absolutely no transparency – but quite a few investigations have been carried out. And fourth and final – the main links to investigative reports and other stuff that are sceptical in various degrees to the first three. On the front page you are asked to sign an appeal for establishing a No-Fly Zone (which would be a violation of international law). A US global development corporation through which government funds for the White Helmets are channelled (according to Mayday Rescue). A film by Danish journalist Nagieb Khaja shown on Al-Jazeera (30 secs into the film one learns that they have saved more than 56.000 lives “since the war began in 2011″ although the White Helmets were formed in 2013). Avaaz means voice or song in several languages and the organisation is known by millions as a petition platform for many good/progressive causes. Avaaz has some 43 million members around the world and is thus easily the largest NGO in the world. Avaaz has also created Purpose.com. Here Jeremy Heimans, co-founder of Avaaz too, speaks to Forbes about his background and what the two companies do. The sad thing is that it has learnt nothing from its own campaign for a No-Fly Zone in Libya. John Hanrahan is a former executive director of The Fund for Investigative Journalism and reporter for The Washington Post, The Washington Star, UPI and other news organisations has made this extremely interesting analysis about how odd it is that Avaaz maintains an interventionist war-agenda in spite of earlier experiences and resistance even by high-ranking militaries. Hanrahan quotes Avaaz’s campaign director, former State Department official John Tye, “that Avaaz shows 54,000 members in Syria in a population of 23 million – which means that even if every Avaaz member supported a no-fly zone, this would still mean that only one of every 426 Syrians had “voted” for one. Avaaz spearheads – at least in this matter – an extreme militarist policy while “Avaaz is a global web movement to bring people-powered politics to decision-making everywhere”. Which people want a No-Fly Zone in Syria? Do they know it’s a violation of a sovereign state’s airspace, of international law? That it would embolden every terrorist on Syrian soil because they would get rid of the Syrian Airforce as their enemy? That it continued into regime change in both Iraq and Libya? Many questions unanswered by this peculiar “people power” organisation, more militarist than governments! They maintain on their website that “The Syria Campaign is fiercely independent and has accepted no money from governments, corporations or anyone directly involved in the Syrian conflict. This allows us full autonomy to advocate for whatever is needed to save lives.” But they also say that they have accepted funds from the Asfari Foundation and the Rockefeller Brothers Foundation and other anonymous donors. “The regime of Bashar al-Assad is responsible for crushing a peaceful uprising that has led to the deaths of over 450,000 people, the displacement of over 12 million – half the country – and the emergence of violent, extremist groups like Isis. 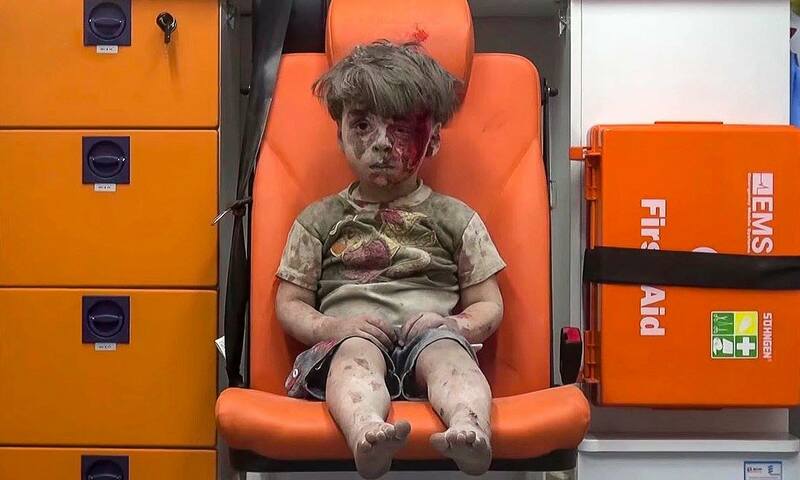 Today the fighting in Syria has given way to a world war with more than eighty countries involved on all sides. The majority of Syrians want neither Assad nor Isis. They want an end to the violence and a democratic Syria. I would characterise such a presentation as side-taking wrapped in substance-free marketing jargon; a very politicised statement wearing only black-and-white. A private company, headquartered in Dubai, that describes itself as “a research, conflict transformation and stabilisation consultancy”. In Syria “Ark has been at the forefront of the response to the conflict … for the past five years”. One of its two team members, Alistair Harris is described here advocating two years ago that “moderates” should be armed to fight ISIS and not only in Iraq but also in Syria. 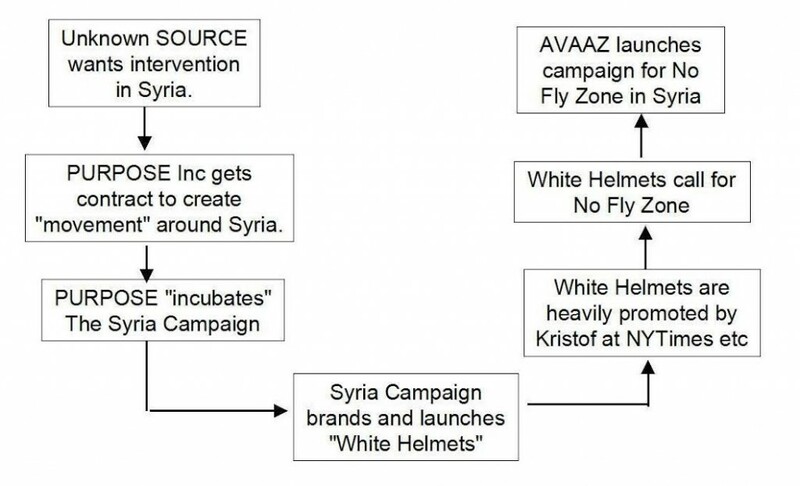 White Helmets, according to their website, received seed funding came from the Asfari Foundation – trustees of which are heavily related to the oil industry and corporate finance. The Asfari Foundation’s bonds with the Syria Campaign is dealt with here. White Helmets: Instrument of regime change in Syria? 1. Huge funding by NATO/EU countries which are militarily involved. 2. A degree of political lobbying – a very specific explanation of the conflict and how it started which points to a no-fly zone, weaponization of human rights issues and speaks strongly against the Syrian government and Russia and very critically of the UN – that is extremely unusual for a purely humanitarian organisation. 3. Incredibly advanced public relation in terms of very professional websites, videos and PR strategy dropping the right stories and images at the right time – quite unique for a group of “bakers, tailors and students” etc..
“Omram rescued from a Russian airstrike” – From the White Helmets’ homepage. 4. Too professional wordings and images, too much playing to (exploitation of) emotions, too catchy smart formulations again and again; in short, lacking every sense of genuine local quality. Too many children – and cats – in the images speaking to an audience with little politically consciousness but surely a good heart. In short, populist marketing also in the sense of conveying the message: Look how good we are and how evil everybody else are. 5. Guilt by association: If the White Helmets is a 100% humanitarian first responder organisation it must be extremely naive in ignoring that its integrity, credibility and noble purposes is put at risk with the specific network of organisations and governments that it has chosen to seek support from. 6. Substance versus public relation: how does a humanitarian organisation justify that millions of dollars are spent on self-promoting public relation rather than on saving more lives in such a horrific war? And taking so many photos and shoot films of its own work in the midst of massacres and bombing raids? 7. It’s very difficult to discern who actually manages the White Helmets in general and in terms of day-to-day operations. One looks in vain for something like an organisational chart secretary-general, board, executive director (although one is mentioned, Raed Saleh, whom the US has on one occasion actually denied entry into the US). 8. How come that such an innovative organisation seems to have been started in circles that have to do with oil interests, British intelligence, mercenary/military operations and interventionist/bombing countries? 9. How come it works only in rebel/terrorist/liberated areas? Could it do that without co-operation or co-ordination with some of these groups? It has been stated – naively – by the Right Livelihood Award Foundation that their vision is to operate also on government-controlled territory and later be a leader in re-building a new democratic post-war Syria. However, why should the sovereign state of Syria’s legitimate government accept a foreign-based and -financed civil defence territory there when it has had its own since 1953? Perhaps we should not be that surprised? Should we be surprised that humanitarian workers are involved in “something else” and are not exclusively devoted to doing no harm and doing good for humanity? Not really. I’ve met that sort of people and organisations during the dissolution of Yugoslavia in the 1990s, among other places at the US Embassy in Zagreb where the humanitarian section people, most likely CIA operatives, after some talk with me about helping the people switched to talk about how good it would be if president Milosevic was killed. Are humanitarian organisations – like most other NGOs today – highly or completely dependent on governments? Yes, most are. And they should therefore always be checked for possible moral corruption and co-optation. Many are no longer Non- but Near-governmental and behave, at minimum, politically correct or serve/promote the interests of their governments one way or the other. Wasn’t Doctors Without Borders started by Bernard Kouchner who advocated military humanitarian intervention as an idea, did the dirty job for NATO in Kosovo and morally advocated the bombing of Libya as a “peace guarantee”? Here an interesting video debate with him at Oxford by Mehdi Hasan. Should it be so surprising that – even liberal, democratic – governments propagandise, construct concrete stories to appeal to the human heart in us all (for a good cause) and that they regularly lie, do fear-mongering, use stereotyping and demonisation, present black-and-white narratives – all of which serve their elites’ interests and may not always be that noble in reality? Think of the ugly shadow world of the global arms trade in which virtually all governments take part in? Of course not. No wars would be possible without one of more of these ingredients. Think of the – invented – story about the Iraqi soldiers who kicked out babies of incubators in Kuwait city – all invented as part of the Citizens for a Free Kuwait public relations campaign which was run by American Hill & Knowlton for the Kuwaiti government. Or, remember James Harf of the US public relations firm, Ruder and Finn, who in 1991 was hired by the Croatian and Bosnian governments as well as by the Kosovo-Albanians to create and promote an anti-Serb attitude in the Western media? If there is anything new in this field since the early 1990s it is the spectrum, the depth, the money and the intensity with which public opinion is being deceived about war and peace – that war today is peace and peace is preserved by violence. And the de facto replacement of knowledge and texts by purpose-driven, mediatized and emotionalised “narratives” and images and films – right down on you phone and into your mind. I do not believe that I know exactly what the whole story and the truth is about the White Helmets. But I know that quite a few things don’t feel right. As a sociologist and peace researcher with four decades of academic and practical experience of global affairs and work in conflict zones, the word spoken by the guard Marcellus in Shakespeare’s Hamlet at Kronborg Castle in my native Denmark come to mind: “There is something rotten in the state…” not only in the bombing state of Denmark (that supports the White Helmets) but also in the state of the – free – media coverage of conflicts and wars. If, thus, you are generally sceptical of Western media coverage of wars fought by the West and specifically of the story of the White Helmets as a purely brave humanitarian organisation – are you then automatically pro-Assad, pro-Russia or pro-bombing? If you are critical to A, must you automatically endorse everything B or C does? Given the “Zeitgeist” of these times, my hunch is that the anti-intellectual’s, the propagandist’s and the blamegamer’s answer is a roaring “Yes!” Personally, I couldn’t care less but there is reason to worry about the fact that our media are not free to take up the issues dealt with here. Pulitzer prize winner, Chris Hedges, talks about “the incessant manufacturing of illusions that feed social narcissism.” The – unwinnable – wars the West fights with the illusory ideology of spreading goodness, democracy, freedom and peace as well as the alleged good role of the White Helmets in it is little else but an expression of such an incessant manufacturing of illusions that feed social narcissism of the many while filling the pockets of the few in the Military-Industrial-Media-Academic Complex (MIMAC). It’s time to give reality show politics and media a reality check. But who can and who will? And who dares now everything will get worse after November 8? A couple of days ago the RFS – Revolutionary Forces of Syria’s – Media Office posted a 54 second video in the online video style of the Mannequin Challenge. It purports to show a wounded man being rescued out of a hole by two White Helmet workers in a bombed out place. You first see them all frozen, the only sound being fighters in the air. Then – suddenly – the wounded person begins to scream because of his assumed pains and the two WHs drag him up from the hole and carry him down to – well, to an empty street with no ambulance or people ready to treat him. In spite of that you hear sirens and lots of people talking and shouting. See the video here on Youtube. It was taken down on the RFS channel almost immediately. First, it is morally outrageous to connect humanitarianism and the rescuing of a wounded war victim with a trendy video style. It’s a dirty marketing trick devoid of humanitarian intent. Ill conceived and tasteless beyond words. Secondly, the video is badly made and one wonders whether it has been financed by the NATO governments mentioned above and who is accountable for this – disgusting – non-humanitarian public relations video. Here a fresh report about it with independent, investigative reporter, Vanessa Beeley, thanks to whom much of this has come to the surface during the last year. As mentioned above, the RLA has decided to give one of its prizes in 2016 to the White Helmets. More here. It starts out with an event on November 24 at the Swedish Institute of International Affairs, UI, in Stockholm and the award ceremony takes place on November 25 followed by a public and political program for the Laureates in Berlin, Geneva and Zurich. One must sincerely hope that the media will dig a little bit in how wise RLA decision is. The RLA – often called the Alternative Nobel Prize – has been at the forefront of rewarding genuine development and peace activists and thus given legitimacy to global alternative thinking by putting the spotlight where it ought to be. Here the RLA Foundation has clearly shot itself in the foot and been carried away by cynical propaganda nonsense (instead of research) behind a dual-purpose organisation with a humanitarian front and a murky back de facto campaigning for No-Fly Zone, regime change and larger military intervention financed by interventionist countries. Our world has so many individuals and organisations who do deeply admirable, genuine work for a better future. Why on earth does the Foundation risk its reputation, goodwill and integrity by making such a dubious choice? Several attempts have been made to enter into dialogue with the Right Livelihood Foundation and urge it to revoke the decision. Regrettably, all letters, however, remain unanswered. The only potentially good thing that may come out of this moral catastrophe is that mainstream media begin to ask questions now the world media light will be pointing to the award ceremony? Since that would challenge the Western mainstream narrative about Syria one must ask: Will they? Why did the US freeze White Helmets funding? The White Helmets in Eastern Aleppo – The world’s most photogenic rescuers?